It’s been a hell of a week. And I mean hell in the nasty sense. Especially pertaining to auto electrics. In nineteen year old vans. With nearly a quarter of a million miles on the clock. And a mound of bougainvillea sitting in a client’s backyard that is supposed to be collected on Saturday. A garage nearby does van hire, so I could reschedule Friday’s jobs to Saturday arvo. Perky Girl reminded me of a mate who has recently bought a new van for his gardening business so now has two but only uses one, but I’ve always been terribly reluctant to ask for favours. Saturday eve, I almost felt a bit upset when Heath Shaw did his knee. That’s unlike me. Two weeks ago I wrote that the Monaros had a reasonable chance of knocking over the Tigers. Since then, four All-Australians have gone down plus the vital but unheralded Dawson Simpson. There’s been a lot of this lately, teams losing two or three players for the match (and still winning). Weird, cos some injuries are always gonna happen but usually, the ones who get injured get injured early in the season. 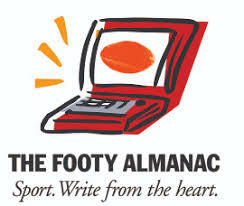 The highlight of the weekend was the inaugural Sydney Almanackers local footy do. A classy gathering, that. Perky Girl and me and Chappy the Super Terrier took the van (it was still running then) to Henson Park and were joined by Mathilde and her bloke Patrick. Interesting fellow, Pat, his gig is the Artistic Director of Upper Queensland. He’s been busy with an interprative dance group, producing ‘Bacon Busters’, a post-post-modern take on pig-hunting with dogs and knives, no sissy guns for this mob, it’ll be premiering at Cooktown Sports Club in the next week or so. Great conversation, two-way, four-way, bouncing around, music, sport, aeroplanes, no awkward silences, a great afternoon. What is the East Coast Eagles? The Sydney Football League used to have teams named Balmain, Pennant Hills, East Sydney, St George. Now, the UNSW East Sydney Bulldogs, as clunky a name as I’ve ever heard. Granted, not every team can manage Grong Grong Matong. But at least clunky tells you something. East Coast Eagles are based in Baulkham Hills. A long way from the coast. The ‘AFL’ alignment denies them an identity. Surely ‘Hills Eagles’ could have been satisfactory, folks in Sydney know what ‘the Hills district’ is. 1997, Balmain Tigers won their first SFL flag after a century of trying. I wrote a match review, interviewed the coach at the club, a cop, the club had done a lot of work to make it viable, establishing itself at the bowls club and playing at the beautiful Drummoyne Oval. Since then it’s been the Balmain Power, Dockers, something else. Gimme a T, gimme an R, how do you spell tradition? Above-mentioned mate said “Take my van.” I might go to church and light a dozen candles for him. Brought to you with the assistance of fear and love. Sorry we couldn’t make it, Earl, but you went and changed the date! Maybe next year. I believe Earl was at the whim of the fixture, Jan. The Sydney Football League changed the fixture and there wouldn’t have been a game at Henson Park the weekend before. Earl, it was a lovely lazy arvo on the hill by the light pole, under the birds – both real and mechanical – riffing on footy and all that. Beats trying to scream at each other in the O’Reilly! Great to meet Pesky Girl and Chappy. The Artistic Director of Upper Queensland sends his best. He’s actually in Cairns as we speak checking on the costumes for the pigs. There was some issue with synthetic fabrics. Um … my Autoincorrect changed Perky Girl to Pesky Girl!! Absurd. Nothing Pesky about J!